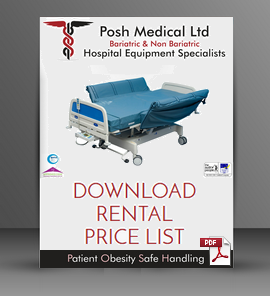 Heavy-duty BodyFoam Bariatric pressure-reducing mattress is designed specially for bariatric patients. It consists of cross section modular cuts on one side for better patient comfort. Suitable to be used on electric profiling bed frames. The modular cut foam ensures that membrane tension on the upper surface of the foam is broken: cuts in the foam ensure independent pressure response to the weight directly above it rather than to the average weight in the area. The 55 stone version has firm side edges for safer and easier transfer. Supplied with waterproof, vapour-permeable, two-way stretch cover. Zip opening is set inboard and underneath of the cover, which ensures the mattress being used the correct way up. It minimises the risk of contamination: underneath zips avoid long upper side seams which risk ingress of fluids; fluids will not rise upwards.